Does your physical therapy resume need rehab? If so, check out this sample to see how you strengthen your resume writing. To be a successful candidate for top physical therapist jobs, resume expert Kim Isaacs says it helps to have a comprehensive resume. Does your resume seem strong enough for a job search, or does it have some pain points that need to be addressed? 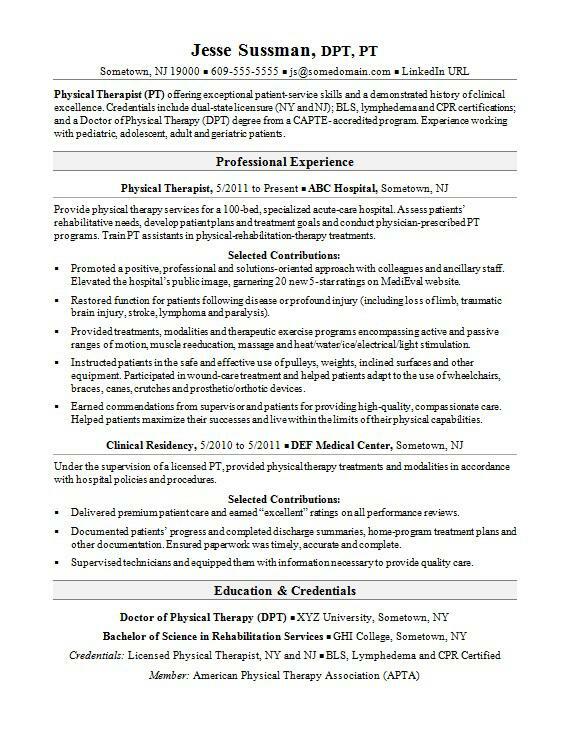 View the sample resume for a physical therapist Isaacs created below and download the physical therapist resume template in Word. Jobs for physical therapists are projected to grow by 28% (or 67,100 jobs) from 2016 through 2026, which is much faster than average, according to the Bureau of Labor Statistics (BLS). You'll find the highest level of employment for this job in the following states: California, Texas, New York, Florida, and Illinois; and in the following metropolitan areas: New York City, Chicago, Los Angeles, Boston, and Dallas. As a physical therapist, you can expect to earn a median wage of $86,850 per year, or $41.76 per hour, according to the BLS. Physical Therapist (PT) offering exceptional patient-service skills and a demonstrated history of clinical excellence. Credentials include dual-state licensure (NY and NJ); BLS, lymphedema and CPR certifications; and a Doctor of Physical Therapy (DPT) degree from a CAPTE- accredited program. Experience working with pediatric, adolescent, adult and geriatric patients. Provide physical therapy services for a 100-bed, specialized acute-care hospital. Assess patients’ rehabilitative needs, develop patient plans and treatment goals and conduct physician-prescribed PT programs. Train PT assistants in physical-rehabilitation-therapy treatments. Promoted a positive, professional and solutions-oriented approach with colleagues and ancillary staff. Elevated the hospital’s public image, garnering 20 new 5-star ratings on MediEval website. Restored function for patients following disease or profound injury (including loss of limb, traumatic brain injury, stroke, lymphoma and paralysis). Provided treatments, modalities and therapeutic exercise programs encompassing active and passive ranges of motion, muscle reeducation, massage and heat/water/ice/electrical/light stimulation. Instructed patients in the safe and effective use of pulleys, weights, inclined surfaces and other equipment. Participated in wound-care treatment and helped patients adapt to the use of wheelchairs, braces, canes, crutches and prosthetic/orthotic devices. Earned commendations from supervisor and patients for providing high-quality, compassionate care. Helped patients maximize their successes and live within the limits of their physical capabilities. Under the supervision of a licensed PT, provided physical therapy treatments and modalities in accordance with hospital policies and procedures. Delivered premium patient care and earned “excellent” ratings on all performance reviews. Documented patients’ progress and completed discharge summaries, home-program treatment plans and other documentation. Ensured paperwork was timely, accurate and complete. Supervised technicians and equipped them with information necessary to provide quality care. If your resume doesn't look strong enough to be discharged and submitted to job applications, it's time to seek treatment. Could you use some help with that? Get a free resume evaluation today from the experts at Monster's Resume Writing Service. You'll get detailed feedback in two business days, including a review of your resume's appearance and content, and a prediction of a recruiter's first impression. Monster's experts will show you how you can improve your resume—and your chances of landing a new job.